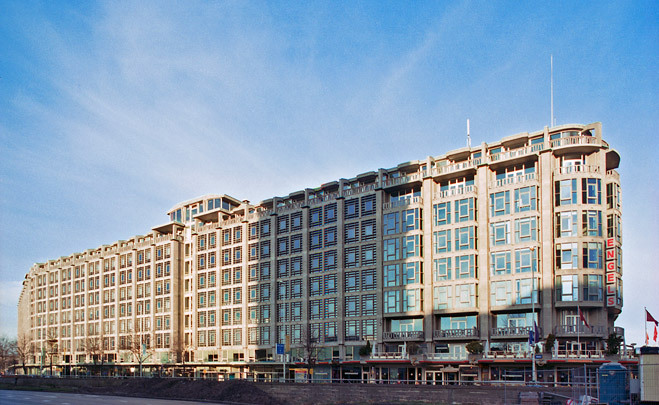 The name of this, the pre-eminent symbol of Rotterdam's post-war reconstruction, refers to the wholesalers who had lost their premises during the air raid of 1940 and had been collectively rehoused in this multiple-occupancy building. The Dutch name as spoken by Rotterdammers, emphasizing the first syllable (groot), is an indication that its great size and grand demeanour are every bit as impressive today. At the time of delivery the vast block (220 x 84 x 43 m.) was the largest building in the Netherlands. But its air of monumentality is only partly ascribable to its size; a more important factor is the rational, repetitive application of just concrete and glass to facades of an almost classical architectural detailing and modelling. The building's mass is broken up by three courtyards and shot through with internal service streets on the ground and first floors. Its main entrance faces onto the station forecourt with four secondary entrances set on both sides of the two building parts separating the three courtyards. Retail spaces occupy the ground floor and mezzanine of the building's outer sides. The remaining spaces are fitted out as storerooms and freely subdivisible office and sales areas. Passenger and goods lifts and galleries around the courtyards deal with the internal circulation. Collective amenities including the famous Engels café-restaurant cluster round the main entrance. Much thought has been given to modelling the facades so that the building with its repetition of cladding units does not appear unduly monolithic. Two shared rooftop canteens stand atop the two intermediate building parts with the roof area between them fitted out as a common terrace. Ten years after delivery, the concrete frame of the rooftop pavilion above the main entrance was completed as a cinema. Here, the large window on the city behind the stage and film screen is still one of Rotterdam's major surprises. The Wholesale Building was restored to its original state by the Van Stigt firm of restoration architects.